G 7216 A (continued): Here is a rough sketch of the tomb chamber. The work of boarding up the walls of this pit continues. Several of the pots found here in small fragments have now been put together as far as is possible. This work also continues, in the camp. G 7516 D: The stone coffin lying across the center of this pit was opened today. It was found to be roughly anthropoid inside [ILLUSTRATION] and to contain a late mummy bandaged tightly. Head east. 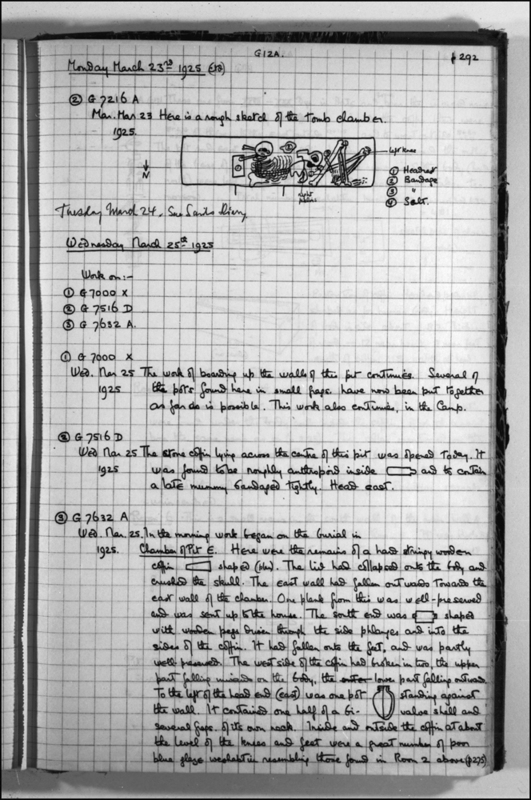 G 7632 A: In the morning work began on the burial in chamber of pit E [sub-pit e = A IX]. Here were the remains of a hard stringy wooden coffin [ILLUSTRATION] shaped (plan). The lid had collapsed onto the body and crushed the skull. The east wall had fallen outwards towards the east wall of the chamber. One plank from this was well preserved and was sent up to the house. The south end was [ILLUSTRATION] shaped with wooden pegs driven through the side phalanges and into the sides of the coffin. It had fallen onto the feet, and was partly well preserved. The west side of the coffin had broken in two, the upper part falling inwards on the body, the lower part falling outwards. To the left of the head end (east) was one pot [ILLUSTRATION] standing against the wall. It contained one half of a bivalve shell and several fragments of its own neck. Inside and outside the coffin at about the level of the knees and feet were a great number of poor blue glaze ushabti resembling those found in room 2 above (page 275).